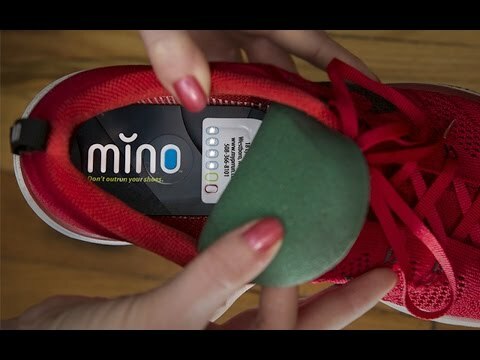 The mino automatically tracks the life of your running shoes. After 400 miles worth of compressions to the mid sole of your shoe, the mino lets you know it’s time for a new pair of sneakers. Dimensions: 4" x 2" x 0.1"
I am giving two sets of these for Christmas so I can't vouch for their quality. Great concept, though, if they are accurate. Simple to load and ready to track. It will be nice to know when to switch out my shoes. I thought they would make an awesome gift. I gave them as gifts and they were well received. Great for a daily runner. My son runs every day. He goes through 3-4 pairs of shoes every year. Now he will know when to buy new ones...for certain. Good sneakers are designed to go the distance, but even the best ones start to deteriorate around the 400 mile mark. 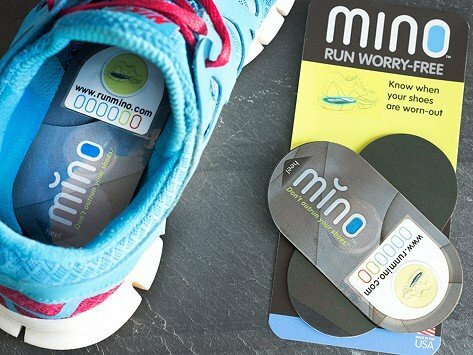 Keep track of the wear and tear with mino (pronounced minnow), a shoe insert that counts foot compressions, so you know when to replace your runners. Maker Aaron Burke was training for a half marathon when a foot fracture caused by worn out sneakers, sidelined him. A medical device professional, he set out to help other runners avoid the same fate. His clever mino design has 6 LED lights that are calibrated to progressively light up, as 400 miles of compressions are tabulated. The mino fits into any walking or running shoe, even children's sizes. It’s so weightless, that it’s nearly impossible to feel underfoot, but for symmetrical purposes, a spacer is included for the other shoe.